Students at a school in America started a boycott over a cup of water. There are now only two drinking fountains on offer for the students to get water from, leaving students worried that queues will be too long for everyone to have reasonable access to fresh drinking water whenever they need it. The only alternative is to buy bottled water, which students feel is unfair. Streator Township High School’s cafeteria stopped its service of giving out free cups of ice water because of the litter and mess being left behind as a result. In reaction to this, around two-thirds of students decided to boycott the cafeteria altogether. The school feels the decision it made to take away the free cups of water was a fair one, despite the difficulties students may now face getting drinking water, and points to the two fountains it maintains as a suitable alternative. 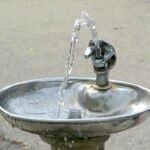 Drinking Water Fountains supplies drinking fountains to many schools and colleges throughout the U.K. and are committed to emphasising the importance of children and young people having adequate access to fresh, quality drinking water at all times.